John Whitmer stands behind a bank of computer monitors, staring up at an afternoon sky. Gradually, the sun arcs across the sky. Within seconds, the shadows stretch until they fall into the darkness of night. The stars begin coming into view, slowly at first, until the eyes adjust to the massive clusters of illumination on the black background. Whitmer is the astronomy instructor at Spokane Falls Community College, not a wizard, and that’s not the actual sky he’s manipulating, but rather the college’s planetarium, which will for the first time open for regular Friday-night public shows (some of which have already sold out) at the beginning of March. Sitting in the 52-seat circular room isn’t exactly the same as gazing up at the night’s sky away from the city, but it’s damn close. And in some ways, for those curious about celestial happenings, this might be better. While Whitmer still takes his classes out to look at the sky, the planetarium allows him, as he’s doing on this particular afternoon, to trace a laser pointer across the domed, wrap-around ceiling, pointing out where we’d see Venus or Polaris (the north star) if we were to head outside later that evening — and if it weren’t cloudy, of course. He hits a button and the constellations become visible, accompanied by drawings of what ancient civilizations thought they represented. He zooms in, revealing stars not commonly visible to the naked eye. All the while, Whitmer’s voice is full of the excited fascination one might expect more from his students than a 14-year veteran of teaching astronomy. “I think this can give you a changed perspective once you realize what you’re part of. It sounds dramatic, maybe, but it certainly does change the way you think about what you might think as a big problem once you put it in context of all this,” says Whitmer, pointing up at the stars above. The planetarium arrived on campus last spring as part of Spokane Falls’ new 70,000-square-foot science building. Since then, Whitmer says that the college has already provided presentations to more than 2,000 elementary through high school students and the planetarium is used on a nearly daily basis during the college’s astronomy classes. 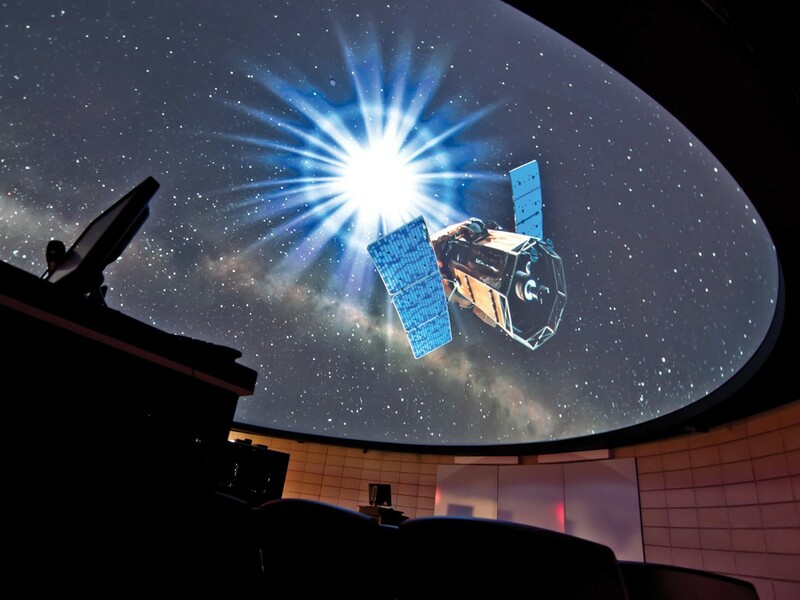 The school is one of only two community colleges in the state to offer a planetarium to its students, and while both Eastern Washington and Washington State universities have planetariums, neither institution is currently offering public shows. A sizable faction of the nearly half-million-dollar price tag for the planetarium came from the student body, making one of Whitmer’s long-term goals for his program a reality. “When they asked us five or six years ago what we wanted [in the new building], we said we’d like a planetarium. They laughed. The budget for the new science building allowed for some growth, but it didn’t allow for a planetarium,” says Whitmer, going on to laud the student body’s contribution. With the public shows around the corner, the college put the finishing touches in the planetarium in late January, capping the building with a nearly nine-ton dome. This gives the planetarium a futuristic, innovative feel — a preview of what’s to be seen once one enters through the facility’s doors. Whitmer and the other presenters of the public shows hope the planetarium will not only be seen as a teaching tool, but also as an entertainment vehicle. There’s no shortage of wonder and awe in the tour of the night’s sky, but that’s actually the second half of the presentation. First, as Whitmer shows me, is a screening of one of three documentaries. The one he projects — with a 360-degree projector that makes it feel like you’re sitting in the middle of the screen, which in a way, you are — is a film about black holes. “You recognize that voice?” Whitmer asks. It sounds familiar. Very familiar. Is that Liam Neeson? Whitmer nods. Looking up at the screen, the viewer is taken through the cosmos, past stars and other bodies with a view that all but puts IMAX to shame. While the purpose of the planetarium is to recreate the sensation of looking up at the night’s sky, this is also one hell of a movie theater and you wouldn’t be blamed for wondering if they’d ever consider showing Jurassic Park in here. He turns off the film as Daniel Bakken, one of the planetarium’s guest presenters, arrives. Bakken previously presented exhibits at Eastern’s planetarium and will now be leading some of the public shows, so he’s come to get the lowdown. The two talk about their plans for the shows, but all the while, much of their attention is up on the replicated starry sky. It appears they’re still fascinated and perhaps are trying to inspire the same sense of wonder in those who come to the planetarium. “Whatever’s up in the sky that evening is what they’ll see and the hope is that people will go out and watch the night sky after this,” says Whitmer.